I've tried bigging up this game over on RLLMUK however it's going unnoticed. It's only sold 2,000 copies which is not only a crime, but goes to show us why we can't have nice things. Alright, so I've had a number of goes at the conquest mode and I'm impressed! This is really difficult to explain as there is a lot going on... But I'll try. It's kind of like a single-player survival board game where instead of rolling dice you have to fight enemies in a Bayonetta Alfheim setting. I won't talk too much about the combat because I'm crap at it right now. You start with one guy at your disposal, and each turn you must address parts of the map for either expansion, reward, or to deter various threats which take their toll on your progress. This is very restrictive at first as you can only have one battle per turn, however you will soon unlock more guys along the way either through random conscripts or via the game's item card system. Let's say you have three 'Aztez' (men/lives) at your disposal at the beginning of a turn, this means you get three attempts at battles across your map. Once spent up it's the end of your turn. If you get killed during a battle then you lose a man permanently, meaning he won't replenish on your next turn. A battle at one of your cities will naturally consist of you versus a small number of enemies. Other than just killing stuff as fast as you can you have bonus criteria to fulfill for bonus rewards. Things like complete the round without getting hit, perform three sacrifices, finish in under 50 secs, score a combo of 80 or over, etc. At the beginning you're up against the standard slow-coach freezer meat which you can mindlessly mash through, it's really pointless learning their tells because they are so slow and useless. Things soon warm up though as during the mid-game you're faced with much faster teleporting enemies and the like. Like in a game of Civ after each turn your cities grant you resources. Resources can be spent on things like preventing dissent or capturing cities to expand your civilisation. After the going got rough for me just now I was able to alleviate the onslaught by spending some resources to buy myself some time until my next turn. There are also weather conditions which take effect on this income such as drought and rains, not sure what they do exactly but their effects also carry over into the battles, at least aesthetically. There are lots of neat little tricks to find out. 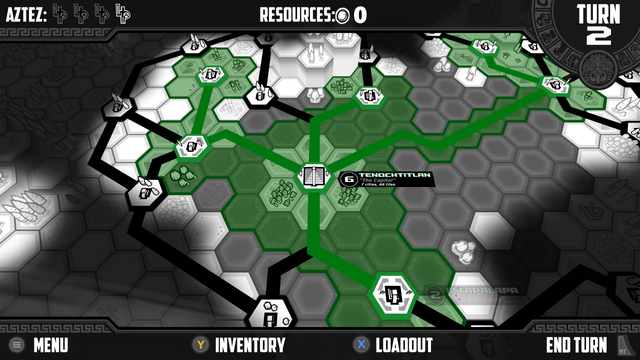 For instance I've only just worked out that you can combat a neutral city going into dissent by preemptively 'buying it out' using the liberation power for a number of resources rather than sending one of your dudes in to prevent this by force (there are also item cards which do this too). This is way more beneficial as you can save one of your available dudes during your turn and use him on something else instead like expansion or reward, or to address a more important red marker event (if you don't stop these red alerts then you're going to get ****ed for it later - they generally do nasty stuff to your map). There are other colours for events too, such as blue for festivals (kind of like crazy infinite bonus stages where you can go for broke fulfilling criteria without fear of losing an Aztez/man/life) and yellow for bulk resource drops or special/rare items. The difficulty system really is novel for this kind of game. I was complaining about the really long delays between audio cue and attack, right? Well as you progress you unlock tougher enemies which are waaaay snappier. On my final go just now I managed to work my way up to Spanish invasions and these conquistador boys have guns at their disposal. I'd never fought these before so they made absolute mince meat out of me. A nice touch is that once you face a new enemy type in the conquest it unlocks them in the arena/practice mode where you can go in to break them down until you master them. I'm absolutely rubbish at fighting right now as I've been working out this conquest mode. Now that I know what needs to be done with the map I'll master all of the enemy types I've unlocked so far so that I can go back to conquest and push even further without getting wasted as much. I've only unlocked a couple of weapons so far however their utility is overwhelming right now. I want to master the basic sword first before moving to something else. You can also unlock the clothing of the enemies and play mix and match dress-up which is quite nice. Currently just traded in my Aztec head feathers for a skull mask, which is a bit more boss. Currently only on Steam ($19.99) - but heading to all consoles very soon, so I'm told. I'm about half-way through the Bloody Palace/Angel Slayer mode (Arena). Some really cool enemies. Loving the conquest mode still. I like the one-hour long single-player board game format. I can easily fit a single go into my extremely busy schedule. Your score is racked up at the end for the leaderboard. Thanks so much for writing about this, dataDave. I'm Ben and was the artist/combat designer of Aztez. I'm only making a point to say anything because it's been a little over a year now, and ever since that Engadget article was posted I've pretty much refused to think or talk about Aztez (for lots of complicated reasons). But then I see things like this pop up and it reminds me that there are some humans who like the game and that's nice. The Festivals don't actually kill your warriors. I think there is one exception, but generally, these are just endurance competitions in which we don't take an Aztez from you. Darkness stops population from rising, and can alter the events that appear on map. It is in darkness you can trigger the event series that culminates in you going into the underworld and running a short marathon for goods, and one of the game's 8 weapons if you beat the event boss. Try going into the underworld with the Twilight Grove item as well. Drought makes the population of the empire drop, and Rain can kill a drought if you can cause it. Randomly occurring is largely because I spent a lot of time making every environment look good in the rain. We should have put a lot more emphasis on this (there is an in-game manual that no-one ever read, but even there we didn't emphasize this), but just spend all of your money on agents every turn. Even turn 1. There's literally no reason to save cash. It would have made a non-trivial difference if everyone playing day 1 and making videos day 1 was using their agents every turn from the start. Especially that conjurer. I appreciate the praise for the difficulty system, and your warrior spirit. Everyone hated the late game. Apparently only Dark Souls is allowed to be hard. Haha! Once you get to the point where you start an empire game by breaking your Smoking Mirror, you'll be in the place we were hoping all players would end up. Thanks for the tips, and yes, I did briefly read your manual prior to playing (thanks for including one). I've got more to say about the game but unfortunately I'm five hours into a fifteen hour grind right now so anything that isn't work-related is going to have to be put on hold. What I will say is I didn't even know Aztez was finished and released until I checked my Steam library at the weekend, yet I'm someone who had been following your development progress on and off over the years. Speaking of which I still owe you $20 (you sent me a preview/alpha code once upon a time, and somehow I now have access to the full game). I might simply buy two download codes for people here at some point to make up for that instead. I'd do this right now but I have a controlling wife. I can spend all afternoon ranting from my armchair here, but please don't give up on Aztez. Get it to consoles and maybe get some financial backing for a marketing push. Featuring on a Nindies Showcase or an upcoming PSN indies reel or whatever is absolutely paramount. Also: Aztez for Smash! Let's make this a thing. Four Aztez and max. population for my capital by turn 2. I'm determined not to screw this run up so it's off to the arena I go in the hopes that I can get some practice in against those dirty invading Spaniards! I'm in a position to sacrifice an Aztez for resources late-game, perhaps.